We have introduced over 4,500 BD OptiBuild™ reagents featuring the BD Horizon Brilliant™ dye family… But we’re just getting started! Our goal is to provide you with the largest selection of reagents so you do not have to make difficult tradeoffs in panel design that adversely affect your research goals. Our near-term focus will be on expanding the portfolio to more cell surface antibodies and more BD Horizon Brilliant dyes. 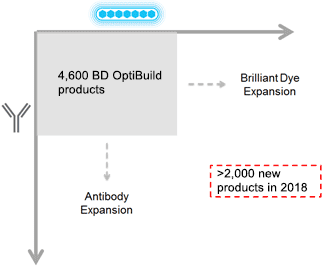 The BD OptiBuild portfolio will also grow through the immediate availability of reagents when new antibodies and new dyes are introduced.